Catalog Home > Fat Brain Toy Co. BRAND: Fat Brain Toy Co. The brightly-colored pillows of silicone can be pushed in and out, over and over again, strengthening fine motor skills. This tactile, sensory developing toy will entertain for hours on end. Explore the possibilities hiding in your LEGO ® collection! 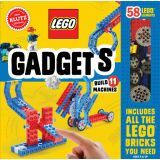 The step-by-step instructions will have you building 11 machines including a gravity powered car and a wacky boxing robot. The fun doesn't stop once you've completed all of the projects in the book. Open-ended prompts will inspire you to continue experimenting with your own designs and modifications! Be prepared for giggles and sensory stimulation! 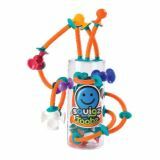 Pipsquigz come in three bright colors, are embossed with wavy ridges, raised dots, and a smiley face, and they rattle when you shake them. 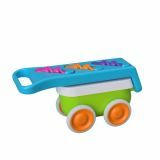 Great for teething, on-the-go, bath time, or anytime! Easy to clean and dishwasher safe, made of food-grade silicone. BPA free. It's endless ball run fun! Grab the ball from the bottom and instantly, all the other balls roll down one level. 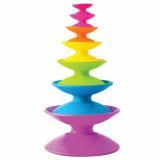 Drop the ball into the funnel at the top and then grab the next ball to do it all over again… And again, and again, and again! 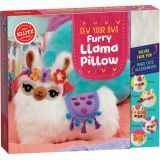 Everything you need is included - It's SEW "llamazing”! Choose from three expressive faces and a variety of trendy accessories to complete the look. Count your way from early learner to kid genius! 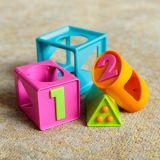 Each block features a silicone number on one side and matching silicone dots on the other. Compare them, count them, and then see if you can flip and slide them together correctly to complete the cube. It's an ideal first brainteaser! Simple design stacks up into endless possibilities! Stack them from big to small. Balance them, roll them, arrange them any way you want. 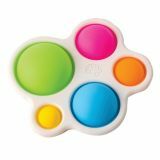 Tactile exploration becomes a creative adventure with this unique set of 7 colorful Spoolz! Let Suction Construction™ build up your imagination. Push ‘em together and then POP ‘em apart. 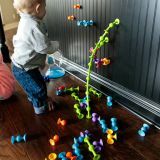 Build amazing shapes, creatures, and wobbly, bobbling towers! Stick them to bathtubs, school lockers, walls, tables, windows; they leave no residue. Introducing the latest revolution in suction construction fun! 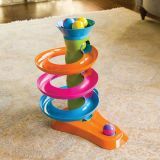 These new Squigz bend, twist, and loop every which way into hours of creative play. Build them tall. Bend them cleverly. Make your structures more wobbly than ever. 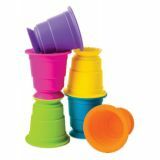 Each of these vibrant, squishy silicone cups features a suction cup bottom plus a suctioning rim at the top. Stack them up tall. Stick them together and then pull them apart to hear them POP! Stick them to the walls of the bathtub or the windows of the playroom. Flip them on their sides and send them rolling. They're 100% food safe AND dishwasher safe! Pull, roll, and discover! Grab the three Twissbits from their slots and drop them into the holes in the base. As children pull the pull-bar, they all twist and turn up and down!